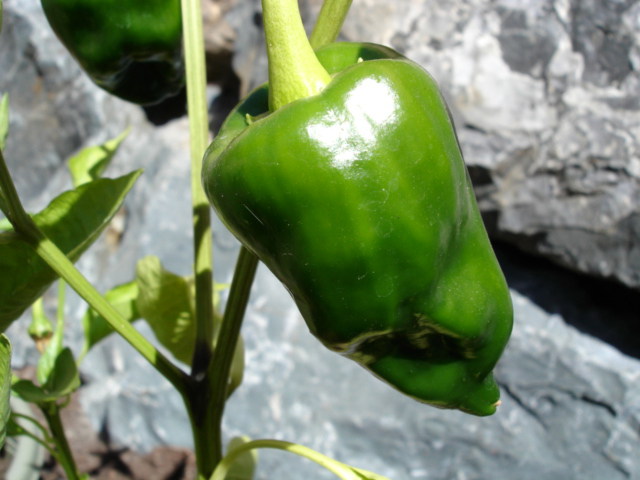 The Poblano pepper (Capsicum annuum) is a type of chili pepper which was originated from State of Puebla, Mexico. Poblano was derived for the word Puebla which is the valley of South Mexico where the peppers was cultivated firstly. These chilies are about 3 to 6 inches (7.6 to 15.2 cm) long and 2 to 3 in (5.1 to 7.6 cm) wide. Their heat index is between 1,000-2,000 Scoville units. Poblano pepper could be found dried, fresh or powdered. They are dark green when young and turn red as they mature. Poblano pepper is also known as Ancho chiles. Some known varieties of Poblano pepper are: Ancho 101, Ancho Magnifico, Ancho Ranchero hybrid, Ancho San Luis, Ancho San Martin hybrid and Poblano L.
Inherent to the State of Puebla, Mexico, its name has been derived from the place where it was firstly cultivated. Poblano are found in two colors: red and green. The red varieties are hotter than green ones. They possess extra mild flavor. 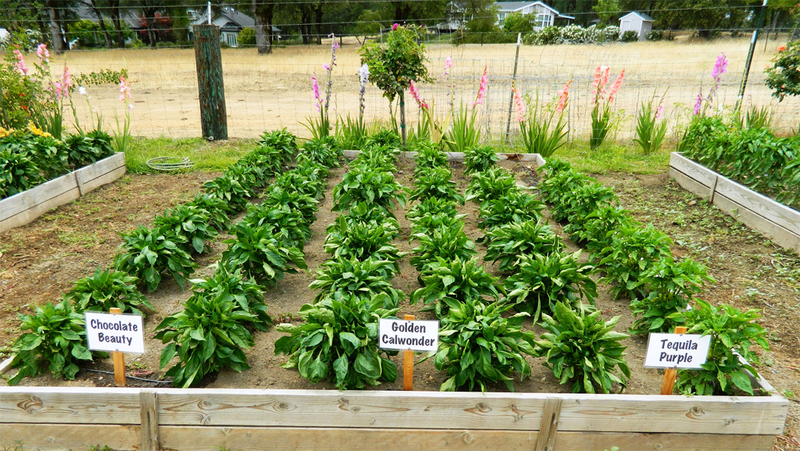 The Poblano pepper of green varieties has temperate taste. 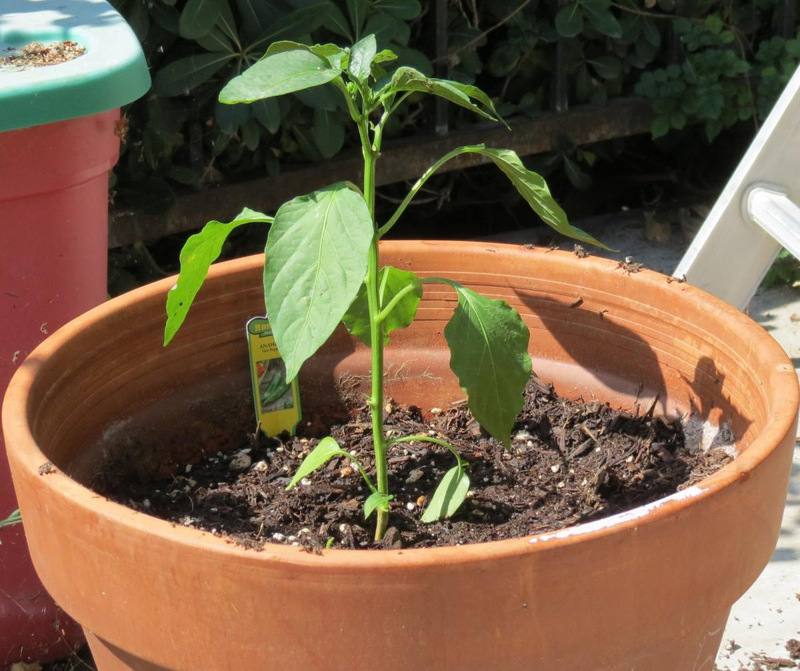 Poblano pepper plants are the perennial vegetable which can reach a height of 2 feet tall. The stems are 25 inches (0.64 m) in size. 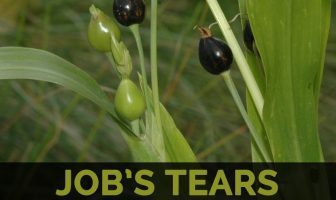 The plant bears the fruits of triangular, heart shaped, 3 to 6 inches (7.6 to 15.2 cm) long and 2 to 3 in (5.1 to 7.6 cm) wide. Flowers have four white petals. 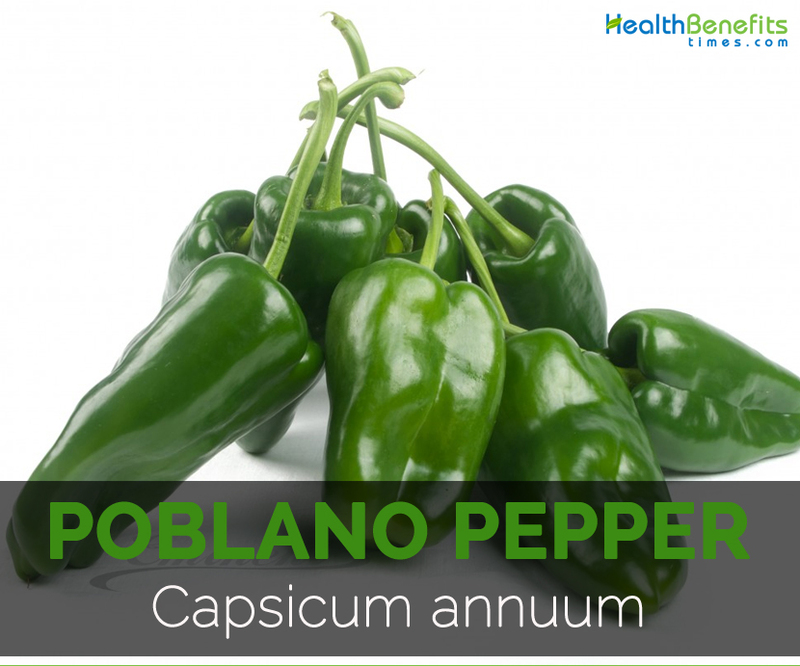 Two Poblano pepper contains 96 calories and 2.79 grams of fat. It also grants 4.03 grams of protein and almost 17.48 grams of carbohydrate. It provides 92.46% of Vitamin B6, 59% of Vitamin B2, 49.57% of Vitamin A, 46.50% of Iron, 19.22% of Copper, 19.21% of Total dietary fiber, 18.91% of Manganese, 17.45% of Potassium, 13.61% of Vitamin B3, 13.56% of Vitamin B5 and so on. Vitamin B6 assists in the proper development as well as functioning of brains. The study shows that the deficiency of Vitamin B6 affects the functions of memory, cognitive impairment, dementia and Alzheimer’s disease. The studies have shown that deficiency of Vitamin B6 contributes to the Alzheimer’s disease. Vitamin B6 controls the level of homocysteine which contributes to the damage of neurons and heart disease. Vitamin B6 is vital for the production of norepinephrine and serotonin which controls the energy, mood and concentration. The researchers consider that ADHD is caused due to the low level of serotonin which results in behavior and learning disorders. Anemia is caused due to the low production of red cells, insufficient oxygen in the blood and loss of blood. Vitamin B2 involves in these functions which helps to prevent and treat the anemia cases. Vitamin B2 is essential for the production of red blood cells and steroid hormone synthesis. It assists in transporting oxygen and mobilizes iron. The riboflavin deficiency patients have the high chances of sickle cell anemia and anemia. The deficiency of Vitamin B2 is related with the production of red blood cells and underutilizing of oxygen. It can lead to shortness of breath, fatigue and problems in exercise. The research shows that Vitamin B2 reduces the homocysteine levels in blood. The adequate intake of riboflavin is helpful for anemia and also balances the level of homocysteine. Vitamin A helps to prevent the chances of macular degeneration that leads to the age related blindness. The people who intake Vitamin C, Vitamin A, Zinc, Copper and Vitamin E, the chances of macular degeneration was lowered by 25 percent. The studies have shown that Vitamin A eye drops helps to treat the dry eyes effectively. The study shows that Vitamin A helps to slow down the growth of Stargardt’s disease which is the cause for vision loss in the young people. During pregnancy, the deficiency of iron increases the chances of premature birth as well as the underweight newborn. The prematurely born experiences health related ailments, delay cognitive development and growth. WHO indicates that the high intake of iron during pregnancy reduces the chances of underweight newborn by 8.4 percent. Copper possess an anti-inflammatory properties which helps to eliminate the stiffness and pain related with arthritis. It assists the strength of muscles, repairs connective tissue and lowers joint pain. The arthritis patients wear copper bands and bracelets because it is considered that copper helps to lower the painful symptoms of arthritis. There is inverse relationship between insoluble fibers and systolic or diastolic blood pressure, triglycerides and cholesterol levels. Additionally, soluble fibers reduce the bad cholesterol by preventing the cholesterol absorption. The intake of high fiber helps to lower the chances of heart disease, hypertension and heart disease. The research shows that the intake of manganese with zinc and selenium assist the people with lung ailments such as chronic obstructive pulmonary disease. Oxidative stress is the main cause for respiratory disorders and chronic obstructive pulmonary disease. Manganese has the ability to reduce oxidative stress and inflammation by producing SODs which is essential to heal lungs. Potassium prevents the weak bones and chances of fractures or breaks. The deficiency of potassium lowers the precursors of bicarbonate which are required to neutralize the acids which are found in the foods such as animal proteins. In the low presence of potassium, the bones won’t be able to safeguard the sulfer acid effects and becomes weak, porous and demineralized. This increases the chances of fractures and osteoporosis. Vitamin B3 helps to lower the cholesterol levels in the body. It reduces the chances of cardiovascular disease in the patients having mixed dyslipidemia. The studies have shown that Vitamin B3 increases the chances of stroke, heart attack and heart diseases which is caused due to the high presence of bad cholesterols, increase in triglycerides and low presence of HDL cholesterol. Vitamin B3 can increases the level of good cholesterol and reduces triglycerides. It also reduces the bad cholesterol. Vitamin B5 helps to deal with stress. Vitamin B and Vitamin B5 is essential for the adrenal functions. The people with chronic stress also experiences adrenal fatigue symptoms. Pantothenic acid helps to calm the nervous system, regulate hormones and combat chronic stress which controls the mood, appetite, temperature and energy. Vitamin B5 helps to regulate the adrenal function and production of stress hormone cortisol. The studies show that the pantothenic acid enhances the adrenal cells. The proper maintenance of cortisol levels is essential for the energy and concentration. Cortisol helps to encounter the inflammation. The smoked and dried form is known as a chipotle which is used generally in mole sauces. Poblano could be dried, fried, coated in whipped egg, stuffed and sauces. This pepper could be canned and frozen. It is the vital ingredient for preparing chili rellenos. They are also well known salsa ingredients.